No fair, introducing science into a global warming debate. 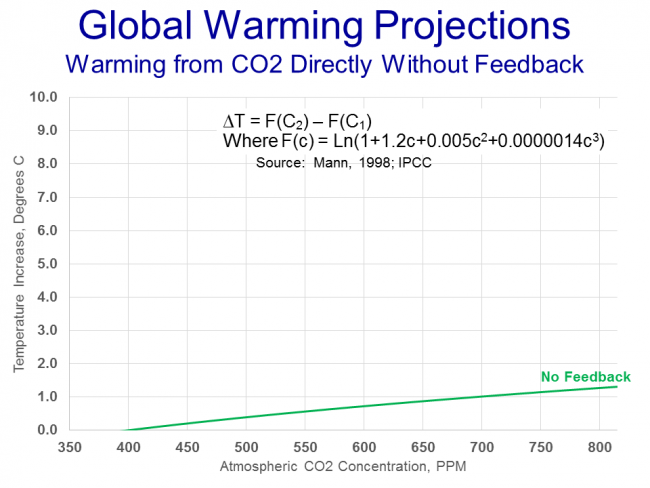 There is solid scientific evidence that the positive feedbacks know that they are only supposed to kick in when the warming is due to human induced CO2 warming. Positive feedbacks have a unique inherit ability to differentiate between the different causes of warming. 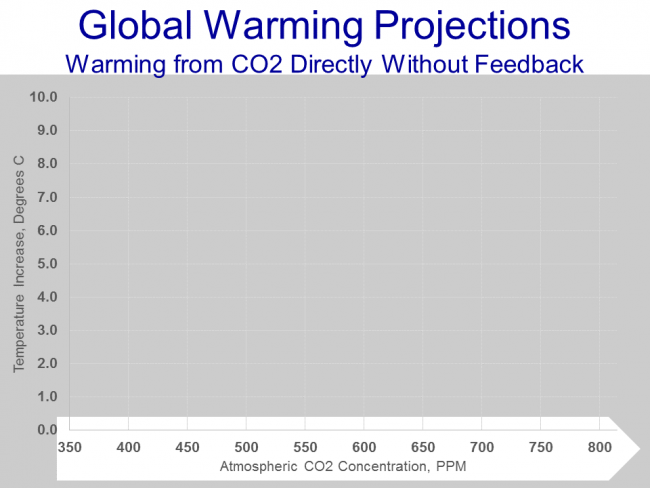 In fact the positive feedbacks have demonstrated that ability by remaining dormant during any of the prior warming periods, yet knowing they will emerge to wreck havoc during any human caused co2 warming. 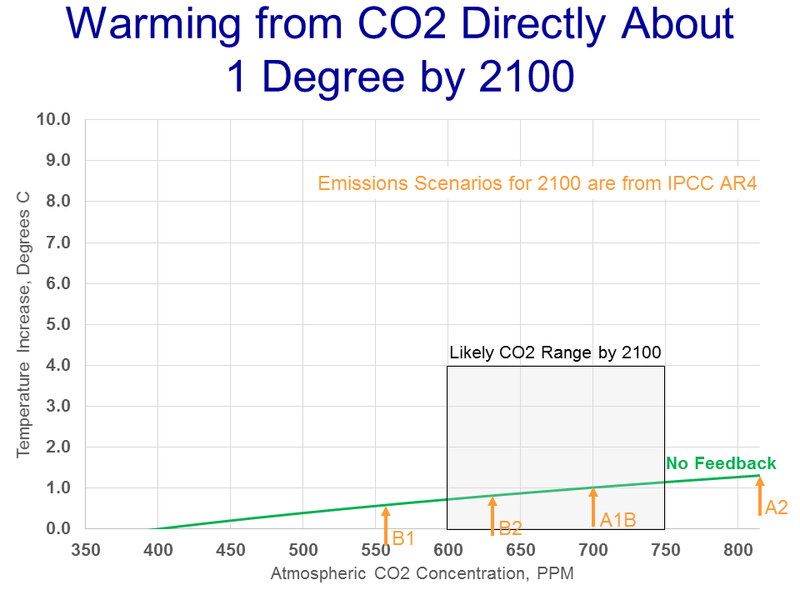 That observed 'diminished return' on CO2 is the hardest item for AGW to overcome when they are pushing for more carbon regulation, I heard the argument that CO2 'stacks up' higher and higher in the atmosphere. 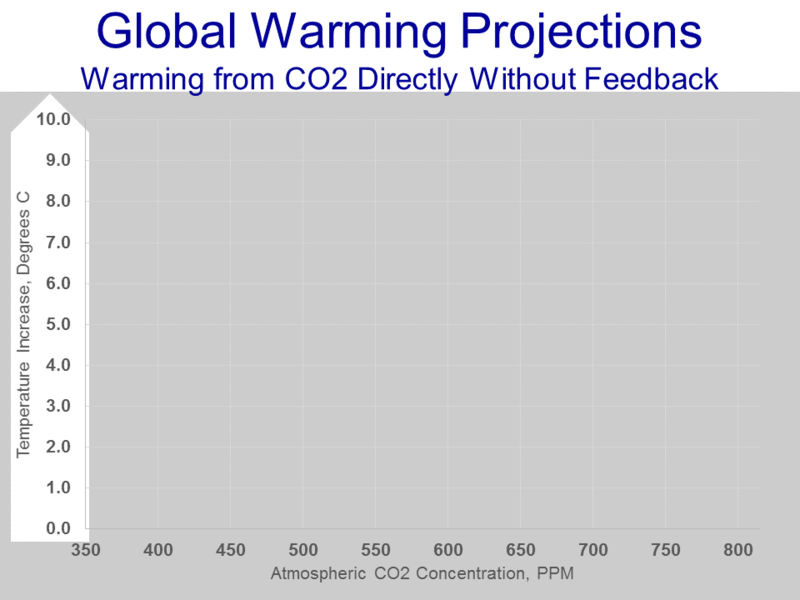 This supposedly overcomes their problem with CO2's absorption range. However I haven't been able to find any proof that actually is occurring. I tend to doubt it since CO2 is a relatively 'heavy' molecule. In the meantime, the sun's output diminishes and the odds favor another major or minor ice age. While we put our money and resources on the wrong end result. I do not believe that anyone knows, or has ever known the temperature of the earth to even the nearest 10 degrees, much less the 1/10 degree we need to discuss this issue. I work in engineering, and I would have a hard time finding out the correct, verifiable temperature of the warehouse I work in, much less the entire planet. Sticking a thermometer in the air is NOT the temp of the warehouse, only that of the air around the thermometer. When you look at temps before 1900, you are in the land of make believe. Also, water vapor (clouds, for instance) is way more heat absorbing than co2, yet somehow it isn't ever included in the models? Really? And ANY issue where the believers falsify records, lie, harass questioners, deny access to their data, and control billions or trillions of dollars is automatically suspect. As Jerry Pournelle says, in the last 1500 years, the earth has been both colder and warmer than it is currently, The crossing of the frozen Thames for colder (the little iceage) and the growing of grapes in Greenland for the warmer. It behooves us to spend money finding out the truth before we bankrupt the world economy to make a bunch of elites richer. "There is simply too much evidence both from our and other planets (as well as simple experiments in a laboratory) to deny that greenhouse gasses in the atmosphere have a warming effect on planets, and that CO2 is such a greenhouse gas." I be happy to examine this "too much evidence". The atmosphere isn't in a greenhouse, and can expand and contract depending on the amount of energy it receives. I believe there's a research paper out there from some Germans expanding on this subject, as well as the madness of referring to a 'greenhouse effect', but it is difficult to rediscover it via search. Water vapor most definitely is included in planetary greenhouse gas models, even the simple one used in my planetary astronomy class 25 years ago. (Clouds are not water vapor; they're liquid water.) But this author appears not to have included it, which would explain why he gets lower numbers. This rather destroys the credibility of what he says, as it's pretty rudimentary. He has separated discussion of greenhouse gases from feedbacks, but water vapor straddles both. It is a strong greenhouse gas (many small gaseous molecules are due to rotational and vibrational bands in the infrared), and its concentration depends largely on temperature. Thus, if temperature rises due to increased CO2 (or other greenhouse gas), then the concentration of gaseous H2O increases, thus the temperature rises an additional amount due to the additional greenhouse effect of the H2O. Temperature measurement is largely by remote sensing (satellites, etc. ), by which one can indeed measure the temperature of every location. Nothing pushing the envelope too hard there; basic meteorology sensing. The temperature of the Earth has been quite a bit warmer than it is now, during the thermal maximum roughly fifty million years ago, well beyond even the alarmist predictions. (The middle of America was an inland sea, though, in part due to sea levels from the warmth.) In the 25 years since my planetary astronomy class in which we calculated the temperatures of the planets from first principle, including greenhouse gas effects, I've not read anything denying anthropogenic global warming that held up to five minutes of scrutiny, sadly, and much that supported it that seemed solid (and some that didn't). The amount of warming doesn't seem as well determined; it's too bad that this article seems to make such a hash of the topic as it's a topic worthy of serious exploration for the lay public. The question of what, if anything, to spend to slow CO2 release is also worthy of discussion, but leads to more heat than light, and questionable policy like forcing Canada to ship its tar to China rather than south Texas. The rapid advances of photovoltaic solar and batteries in recent years appear to be on track to make them cheaper outright than most conventional energy within years, far faster than governments can act. The best policy might be to get out of the way of solar. I realize that your starting point, ln(1+1.2c+...), is supposed to be a neutral "scientific" fact on which all can agree. But it derives from a model, and that model includes certain assumptions. Like, the CO2 is perfectly mixed into the atmosphere, which consists of N2, with no H2O, and is stratified according to some rule or other. If you are going to make a model, you will need to have some such assumptions. But the thing is, those assumptions, whatever they may be, are demonstrably false. There is no "neutral" model from which to start. Your model may be "the consensus of both sides of the debate", but that does not make it science. In fact, no one knows whether climate is even predictable. It is quite possible, on mathematical grounds, that climate is chaotic. This would mean that two sets of initial conditions which are arbitrarily close together, will ultimately diverge into very different outcomes. What this would mean, is that it is easy to predict the weather for one minute, less so for five minutes, even harder for a week ... sound familiar? If this strikes you as absurd -- how could there be anything Science can't predict -- imagine an island in the middle of a wide river. The river has twists, and turns, and narrow places. You are twenty miles upstream from the island. Put a drop of ink in the river. By the time it goes twenty miles, it will be thoroughly mixed. Half the molecules will go left of the island, and the other half will go right. Label one side of the island Glacial, and the other side Interglacial. Pick a molecule in the drop of ink. Make a model that can predict which side of the island it will pass. Show your work, the exercise will be graded. 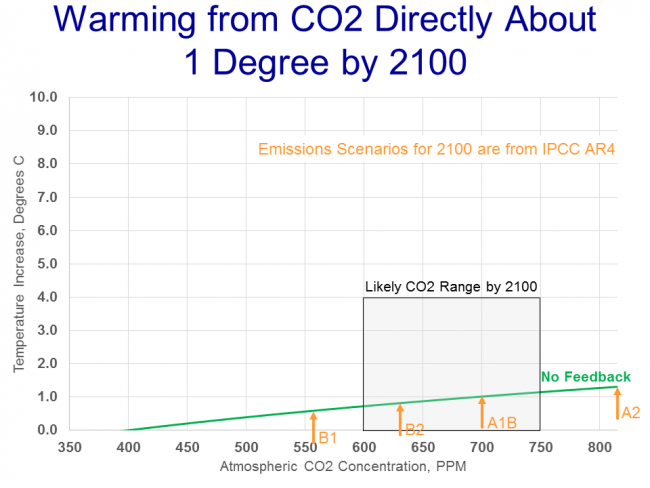 It's a doubling from 280ppm that causes ~1.5C warming... not 400ppm. In Coyote's 'Basics' post s/he wrote: "...these gasses only absorb some but not all frequencies of radiation, there is a diminishing return effect. 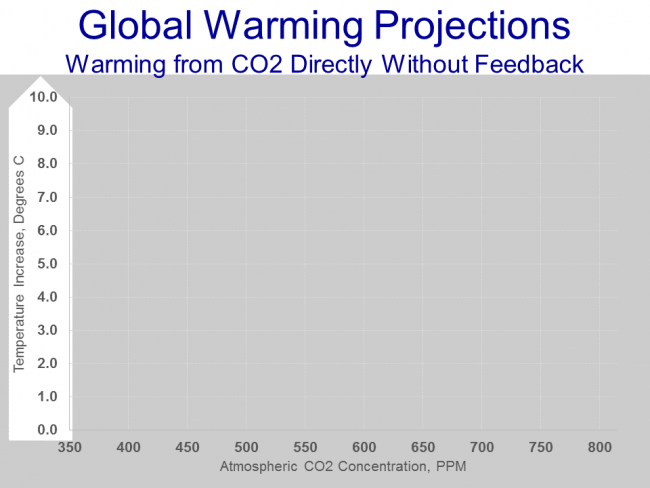 Each additional measure of a greenhouse gas added to the atmosphere absorbs less heat than the previous measure added." 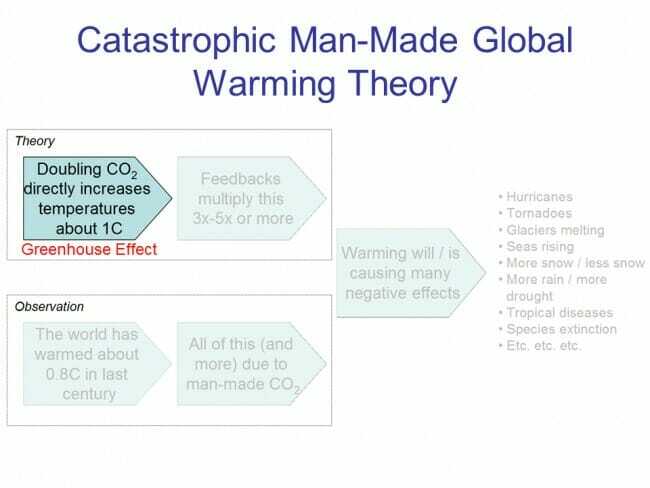 This is not true as there are more effects than are captured in the simplistic Mann equation Coyote used in "Greenhouse Gas Theory". Check out the Advanced tab at . BTW: If "the sun's output diminishes and the odds favor another major or minor ice age" why is global temperature rising? Because of human greenhouse gas emissions & land–use changes. An engineer should know that it is possible both to measure an average temperature for a building. E.g., HVAC engineers develop models for buildings before they're even built — and their models get better over time as they see how the resulting buildings perform and they tweak their models. In fact, chaos is well established in climate models — in fact, Edward Lorenz 'discovered' chaotic behavior in an early atmospheric model. Climate modelers know there is a certain amount of chaos in the climate system — it generates oscillations like El Niño Southern Oscillation, the Atlantic Multidecadal Oscillation, etc. In fact it's easier to model long–term trends (climate) than it is to predict the weather more than a few days ahead. Check out  below. Your river–ink–island analogy is not a good one; it assumes the island is in the middle, the flow on either side is equal, etc. State the topology & roughness of the riverbed, the volume of flow, and the position of the island and the location of the ink insertion, a hydrodynamicist could model the flow and estimate the probability distribution of where the ink particles would go. Predicting the behavior of a single particle (or water droplet in a cloud) is not necessary for developing a useful model.